When it comes to makeup, there’s nothing worse than having a flawless look ruined by oily skin, especially within a couple of hours of application. If you find that you’re frequently plagued by shine or excessive oil during the day, there’s a good chance you’re using the wrong kind of foundation. A high-quality, oil-free, oil-controlling foundation will reduce shine over the course of the day, if not eliminate it. Here are 10 of the most popular foundations for oily skin, with options ranging from a dewy finish to an ultra-matte look. 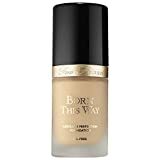 Beauty bloggers and editors almost unanimously agree that Estee Lauder’s Double Wear is not only a quality product but also the best foundation for oily skin. This brand has a legacy of making high-quality cosmetics, and Double Wear is no exception. The formula is oil-free and oil controlling, and the brand boasts that it’s lightweight, lasts 24 hours, and leaves a flawless finish. With 38 shades from light to dark and many different undertones, there are plenty of options for just about any skin tone. Fit Me Matte is hands down the beauty community’s favorite drugstore foundation for oil control. Like all great cosmetics, it’s non-comedogenic, which means it won’t make you break out or clog your pores. And the brand boasts it’s ability not just to control oil but also blur out pores. Best of all, it’s dirt cheap. Available in 40 shades from light to dark. Powders are still great for controlling oil, but they don’t always offer the most coverage. The Original Matte Foundation from Bare Minerals offers buildable medium coverage for a barely there finish. Beyond being matte, this mineral foundation claims to use only five pure ingredients and blocks the suns harmful rays. With 20 different shades, it offers a decent selection, but not quite as wide as the Double Wear or Pro Filt’r. The beauty community loves this foundation because it’s less drying than the average oil-free option. Infused with coconut water, it hydrates the skin while still controlling shine. It also contains hyaluronic acid, which is well known for smoothing wrinkles and fine lines. Born This Way comes in 24 shades, and can be purchased at Ulta or Amazon. One of the newest entries into the beauty space, Fenty Beauty released its remarkable line of 40 shades of foundation in September of 2017. It received mixed to positive reviews from beauty gurus and customers alike, but they all agreed that this foundation is super matte. So if you’re looking for oil control but still want a dewy finish, this probably isn’t the product for you. But for girls with excessive oil, this product’s matte finish is a must. It’s no surprise that a beloved beauty brand like MUFE would put out a fantastic matte foundation. 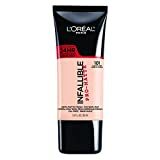 This build-able foundation offers full coverage with a real-skin finish, avoiding a caked-on or painted look. Best of all, this highly rated oil-controlling foundation is well known for being long-lasting. This foundation is probably the second most recommended drugstore foundation for oily skin, right after Fit Me. Many beauty fiends love this option because it is lightweight and has a demi-matte finish, which allows the skin to retain a dewy look. Sadly the shade range is quite limited, as it is currently only available in 12 different hues. But on the upside, it’s easy on the wallet can be found at Ulta, Amazon.com, or just about any drugstore. This foundation claims to not only control oil but also to reduce the look of enlarged pores. On top of that, it includes skin nourishing vitamins and fruit extracts and also has an SPF of 20. While it’s not the top recommended foundation for oily skin on the market, it does seem to make the short list according to most beauty editors. Unfortunately, it’s only available in 10 shades, with limited options for pale or dark complected girls. On the higher end, the Oil-Free Foundation from prestige beauty brand Eve Lom is a must free for the shine-prone skin. In this pricey foundation, rice powder is the active ingredient for absorbing oil. It’s also SPF 20. Available at high-end department stores, you also can purchase it on Amazon.com. Amazonian clay is a miracle ingredient well known for reducing engorged pores and controlling oil. There aren’t many foundations on the market that include it as an ingredient, which is what makes it such a treasure. This product is also vegan, oil-free, and hypoallergenic, with an SPF 15 broad spectrum sunscreen. Everyone’s skin is different, so it’s important to try a couple of options before settling on one that works for you. Thankfully, most Sephora stores and makeup counters will color match you, this way you can try the foundation all day before making a final decision. And don’t forget that oil control is a multi-step system; an excellent primer, setting powder, and a pack of blotting papers in conjunction with the right foundation is the best way to keep oil at bay all day.